A magical genie costume would not be complete without colorful genie makeup. 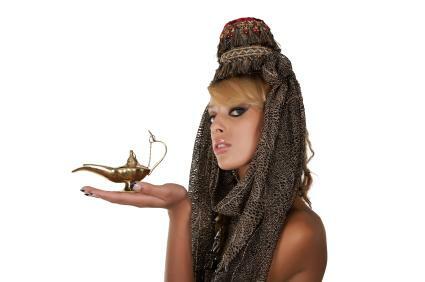 A genie is a mythical creature who grants wishes to whoever rubs the lamp she calls home. Television genies like Jeannie from "I Dream of Jeannie" and Robin Williams' animated portrayal of Genie in "Aladdin" show us what two different kinds of genies may look like. The makeup of a genie commonly includes bright colors like blue or purple and may be an eye look, or a more complete covering of the entire face and body, each done in these bold colors. Decide what kind of genie you wish to appear as before beginning your makeup. Paint your eyes with a mystical blue or purple to get a makeup mask. Easier than painting the whole body, a makeup mask style is fun and flirty. Use these steps to get this look. Wash your face and eyes removing any old makeup or debris. Pat your skin dry and apply an oil-free moisturizer. Allow the moisturizer to absorb in the skin for a minute before proceeding. Apply makeup to the entire face. Choose a cream to powder or mineral powder makeup to get good face coverage. Men may wish to skip this step. Sweep bronzing powder over the face to get a nice glow. Brush the eyebrows upward and outward. Give the eyebrows solid definition by using a brow liner pencil. The eyebrow should have a lift or arch in the center. Apply an eye primer to the eye area. Allow the eye primer to dry for one minute before applying your eye makeup. Use a wide-tipped eye color pencil in medium blue to draw an eye color mask on your eyes. Draw from the inner eye up to but under the brow bone. Continue to draw under the eyebrows to the outer edge of your eye. Extend your eye color in a sideways "V" shape about 1-inch from the edge of your natural eye line. Finish the mask by lining under the eye. Fill in your outline with a vibrant blue eyeshadow that has a bit of frost to it. Blend the colors together with an eye brush. Line your eyes with black eyeliner. Make the eyeliner look "cat like" by lifting the ends a little and extending them out past the natural eye line. Apply two or three coats of mascara to your eyelashes for full, fluttering eyelashes. Apply pink rouge to your cheekbones and touch your lips with a pink lipstick. Men may want to skip this step. Get a full-blown genie makeup look by painting your face, or your face and body, with royal blue body paint. If your costume top is a vest or half shirt, you will need to paint your chest, back and arms. If your costume top and pants are long, you may be able to get away with painting your face, neck and hands only. After your body paint is applied, you should apply deep black eyeliner to your eyes to give your genie costume a slightly exotic look. Use your eyeliner to draw on a goatee too. Offering body painting with a shimmery look is the specialty of Star Light and Magic. For a truly magical, otherwordly look, choose their quick drying "Dark Blue." Body paints come in 4 ounce bottles for a reasonable cost. Genie makeup is exotic-looking and out of this world. Use safe non-toxic body paints or makeup from your makeup kit to get a full or partial genie style makeup look.